Chris reached out to us a few weeks ago wanting to create a website for his service. He works in an environment where he creates documentation and helps to certify welders and wanted to use his talents to help other individuals and businesses with these services. We put together a simple site for Chris that is mobile friendly with a contact form and added the information that he requested to have on the website. The website was approved today and is now live! 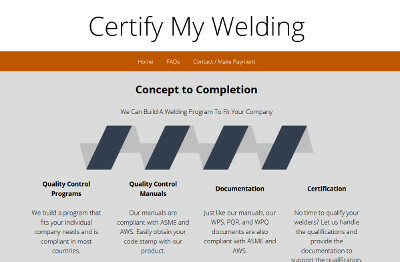 Certify My Welding can be found at certifymywelding.com.